Jimmy Teo, CEO An unmanned retail outlet seems more like a futuristic concept in a world where standing in line for billing processes is anything but ordinary. Though there are very few self-checkout stores in existence, mainstream implementation of a completely technology-driven retail establishment—where customers can walk in, pick up the product of their choice, and walk out of the store—maybe unheard of in the current day and age. However, having the foresight and the vision in tomorrow's retail, DCS in 2017 co-founded a specialist New Retail company, Unigons to transform tomorrow's retail landscape. DCS Synthesis specializes in unified payment systems by introducing ‘Smart Experiential Spaces’ for customers to have an immersive shopping experience. “The value of our company is not only delivering innovative solutions to the retail space but also developing DCS Synthesis as a social enterprise to generate return on investments and give back something valuable to the society that we earned from,” begins Jimmy Teo, CEO of DCS Synthesis. By employing technologies such as Radio-Frequency Identification (RFID), object detection, and facial recognition, DCS solves the manpower crunch that the retail industry has witnessed in recent years. 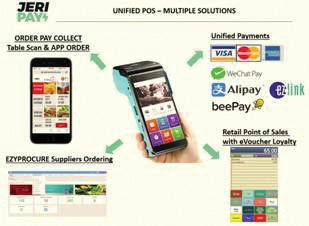 In addition to its innovative strides, the company has developed an integrated e-wallet payment terminal service by collaborating with financial institutions and banks, thereby crafting a one-stop point of sale (POS) solution for retailers such as malls, restaurants, cafeterias, and shopping outlets. Jeripay, the company’s flagship unified payment solution, is a manifestation of DCS Synthesis’ collaborations with these financial institutions. The payment terminal is capable of accommodating various functions such point of sales, credit card payments, procurement, and global blue tax-free functions for all retailers through a single device. It is the first Unified Payment terminal in Singapore that works with different Banks to provide a one-stop unified payment terminal for all retailers, in turn, reducing operating costs and physical space allocations in the retail counters. The solution also functions in coherence with Order Pay—DCS Synthesis’ mobile solution that employs RFID and QR codes for payments—to carry out various retail operations. On the other hand, Retail Eye—another vital component of the company’s arsenal of retail solutions—offers malls a Shopper Tracking Systems using mobile devices and facial recognition technologies to monitor the behavior of visitors in retail environments. “We are always focused on the goal of providing a one-stop service for all Retailers and Malls and delivering a holistic solution to all clients. Our constant efforts in innovation allow clients to adopt newly integrated technology to increase their performance and customer service without much cost,” adds Teo. “When we started the company back in 2003, our sole focus was delivering POS systems to the retail industry. We later on adopted products such as RAPTOR (F&B POS) and QUORION (CASH REGISTER) systems, which now, provide service to over 1000 clients including the Changi Airport POS systems,” explains Teo. Since then, DCS Synthesis has witnessed steady growth, gradually increasing its clientele and showcasing its expertise in a diverse range of payment solutions. In the year 2005, the company collaborated with AsiaMalls—one of the first adopters of integrated sales platform—by employing DCS Synthesis’ Tenant Management system to aggregate sales data from multiple retailers within the mall, in turn, gathering information clusters to create a big data system. Since then, DCS Synthesis has deployed its products to over 80 percent of malls in Singapore and 60 percent of malls in Malaysia, including prominent clients such as Capitaland, Mapletree, City Development, Keppel Land, Frasers, Lend Lease Sunway, Genting and Mercatus Malls. 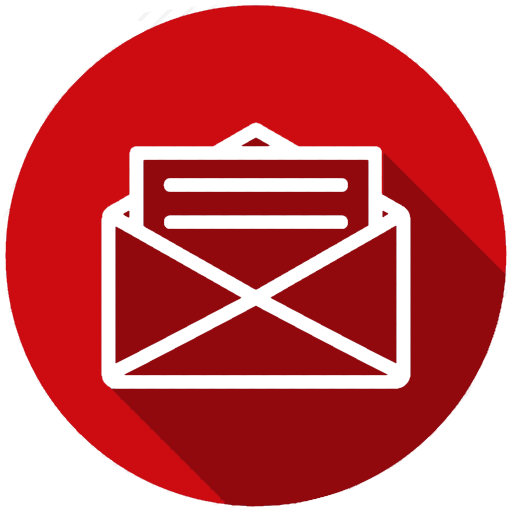 The company subsequently went on to develop Mall CRM Loyalty platforms with the motive of providing a central loyalty system with Mall Voucher Management and promotion features. These strides led to the launch of 3 major retail solutions—Tangent 360, Marketing 360, and Retailer 360—forming a conglomerate big data platform for data analysis and transcending into innovative, easy-to-implement, cost-efficient technologies such as RFID. “There has been the lingering perception that RFID technology is expensive, and therefore, difficult to implement and irrelevant in the current generation. However, that is not true, as RFID has become cheaper and efficient. 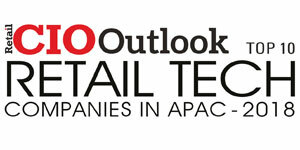 It serves as a game- changing technology for retailers to revamp their workflows,” emphasizes Teo. Highlighting the benefits of employing technologies such as RFID and object recognition, Teo talks about a recent collaboration that sheds light on the mitigating some of the prominent challenges plaguing the retail industry—scarcity of manpower, changing customer preferences, and delivering better customer experiences. One of the leading apparel suppliers in Singapore, Decks, adopted the RFID technology to streamline their business processes. Decks deals with various brands such as Beverly Hills Polo Club, Surfers Paradise, Royal Knights of Scotland, and Island Shop. However, with a diverse clientele such as this, accounting the inventory became a tedious task, and the apparel giant struggled to display products that are for sale as a result of prolonged processing times and delayed delivery of products. By utilizing an RFID-based inventory management solution, Decks was able to reduce 70 to 80 labor hours in a day, allowing the staff to focus on more resourceful tasks. 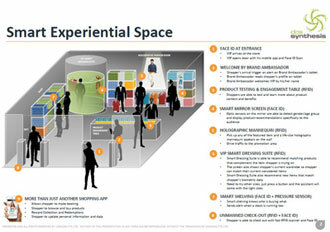 The company then extended the functionalities of RFID peripherals by designing Smart fitting rooms where information from these sensors are displayed on a touch screen panel, thereby enabling the customers to take a look at various sizes, color schemes, and recommended products without leaving the trial room. These trial rooms increased the sale conversion rates as the implementation proactively engaged the customers in trying out different products. On a larger scale, the project witnessed significant growth: customer satisfaction results increased by 30 percent with loyalty customers adding up to 50 percent, process improvements scaled by 50 percent, and the audit outcomes registered a staggering 111 percent growth. Among the employees, productivity increased by 20 percent with a substantial increase in revenue and remunerations. DCS Synthesis aims to deliver more of a personalized experience to customers in the near future, as opposed to the traditional way of shopping. Consider a shopper entering a clothing outlet that would be powered by DCS Synthesis. The shopper or the VIP would arrive at the store by opening the doors using facial recognition on his or her smartphone. Immediately, an alert notification will be sent to the brand ambassador present at the store, after which, the guests would be welcomed by name as the ambassador would have read the VIP’s profile when they check in. The shopper will then move towards the clothing area where he or she can try out different attires while learning about each product. 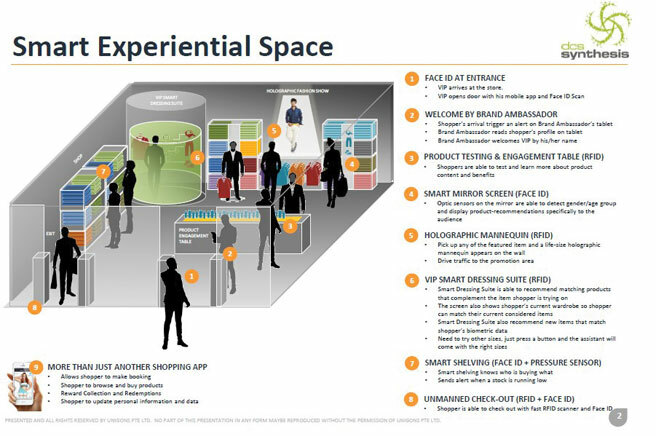 By utilizing RFID peripherals, the retail outlet will detect the type of clothes picked out by the shopper, and then will display recommendations based on the preferences of the VIP. This will allow the retailer to project a holographic mannequin on a wall and showcase a life-size human trying out the clothes; the technique would not only drive traffic to the promotional area but also enable the shoppers to visualize the outlook of the attire displayed. All of these features are to be encompassed in the VIP Smart Dressing Suite, which would also present the shopper’s current wardrobe, offering a comparative perspective to the VIP. 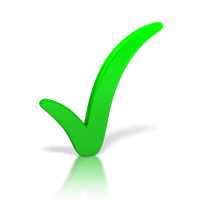 With a push of a button, he or she can seek the help of a virtual assistant to try out different sizes or colors. The company also aspires to augments technologies such as Face ID and pressure monitoring sensors with the Smart Dressing Suite to detect objects lifted by a customer, thereby notifying retailer about products that are running low on stock. Once the shopper decides on the products to be purchased, he or she can walk past the RFID scanners and Face ID sensors to check out the items purchased automatically. On the other hand, DCS Synthesis will enable shoppers to make bookings with their retailers, browse various products, and collect reward or purchase redemptions on a mobile application customized to the user’s preferences. A similar experience will be delivered at cafeterias and restaurants, where visitors can enter the diner with facial recognition or ‘Smile ID,’ pick up the food and beverage of their choice, place all the items on a tray that registers the Face ID and product RFID, and leave the diner using Smile ID at the exit. Few of the notable merits of such an establishment is that the chefs and the kitchen staff will be alerted about food and beverages that are consumed at a rapid pace, taking into account the stock of items left on the shelves. Similarly, guests can order food on their smartphone and be notified about the status of their dinner or lunch as they wait at the table. “Our technology will ease the payment methodologies for shoppers, without needing to wait in line to complete a purchase or order a service. We have incorporated QR codes that allow guests visiting a restaurant to order food by merely scanning the code on the menu,” explains Teo. As the retail market evolves into collaborative environments, DCS Synthesis offers a niche, yet cost-effective retail solution set to help clients reap maximum rewards from products and services, thereby assisting clients in traversing the road of digitalization with greater efficiency and better profitability.